Corning Announces Availability of USB 3.Optical Cables – Carpet Bomberz Inc. 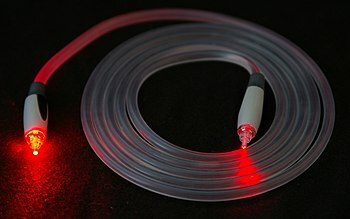 Currently available in lengths of 10 meters, Corning will also be releasing USB 3.Optical cables of 15 and 30 meters later this year. These cables can be purchased online at Amazon and Accu-Tech. via Corning Announces Availability of USB 3.Optical Cables. As I’ve had to deal with using webcams stretched across very long distances in classrooms and lecture halls, a 30 meter cable can be a godsend. I’ve used 10 meter long cables with built-in extenders and even that was a big step up. Here’s hoping prices eventually come down to a reasonable price level, say below $100. I’m impressed the power can run across the same cable with the optical fiber. I assume both ends are electrical-optical converters, meaning they need to be powered. So compared to CAT-5 cables with extenders it seems pretty light weight. No need for outlets to power the extenders on both ends. Of course CAT-5 based extenders are still very price competitive and come in so many formats, USB 3.0 is trivial and probably more price competitive in the 30 meter range. But cable runs in CAT5 can be 50 to 100 meters for data running over TCP/IP on network switches. So CAT-5 with extenders converting to USB will still have the cost and performance advantage for some time to come.